Put your confidence in a service in Mill Hill with a customer rating of over 96%! Q: How will the window cleaning polish my premises? A: We can promptly remove splashes with either external window cleaning (for four-storey properties), rope access window cleaning (for high-rise properties), or via the well-known manual cleaning of interior panes. Q: Can you explain me a tad more about your water-fed pole cleaning approach? A: Absolutely! This gear can expand up to 22 metres in length, allowing the cleaners to painlessly reach and wash even the remotest corners of your glass surfaces. A: Our water is purified from any residue-causing minerals. When this liquid vanishes under the sun, it won't leave any smears behind. Q: Will you carry out your service in a rainy weather? A: Rainwater is usually unpolluted, so it won't deter us from doing our responsibilities. However, while we won't have anything against a slight drizzle, a sudden rainstorm can bring unsatisfying results. During thunderstorms, we may have to postpone our service for a day of your preference to ensure the technicians' safety. A: No, the practiced window cleaners in Mill Hill can easily perform external window cleaning without you being around, as long as your property gates are unlatched. And if you want your casements to sparkle on the inside, just book our complimentary key pick-up and delivery alternative instead. 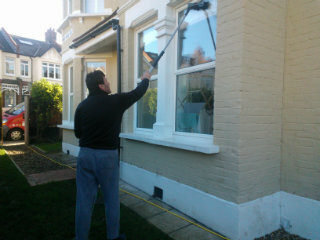 A: Yes – we will clean your PVC or UPVC frames and sills for absolutely free! With the intuitive water-fed rod equipment, the professionals can help you outclass your competition at reasonable rates. And you can lower our window cleaning Mill Hill rates even further by mixing two or more of our cleaning services together! To learn the exact amount behind our price offers, make sure to browse our convenient price table below. Regardless of where your stains have taken shelter, our capable window cleaning in Mill Hill will eliminate them with ease. We have included a number of washing methods. Our external window clean is suited for buildings with no more than four storeys. To let the daylight back inside, the window cleaners in Mill Hill will come in a van, outfitted with an extendible water-fed rod. This gear is connected to a water tank, filled with distilled water. After being released as a powerful flow from the pole's brush-head modification, the water will absorb all blemishes in an attempt to regain its natural structure. To reach smudgy window corners of lofty properties, we'll send an established team for rope access window washing. These approved abseilers will utilize well-maintained ropes and harnesses or set up ladders and cherry pickers to bring back the appeal of your panes. We've got all important COSHH records in place and follow each safety requirement. To make the interior side of your glass façade just as lustrous, the pros will rely on the usual ladder and sponge cleaning method. Over time, we've answered the cleaning calls of customers from many neighbouring regions. As a direct result, we broadened window cleaning Mill Hill's horizon and you can now see our washing vans in the districts below. For those of you who'd rather book window cleaning services Mill Hill NW7 online, fill in our get a free instant quote form.